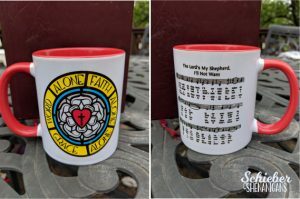 Home→Katie Luther Posts→Giveaway- Lutheran Coffee Mug with Schieber Shenanigans! 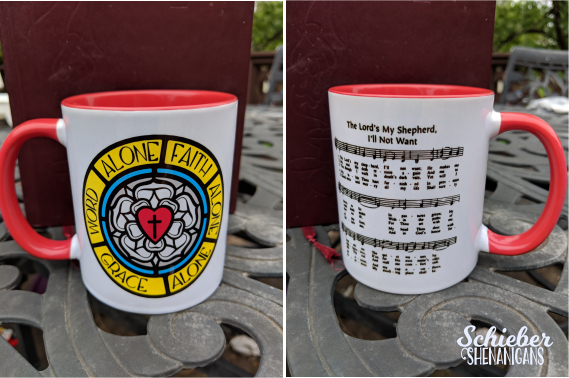 Giveaway- Lutheran Coffee Mug with Schieber Shenanigans! 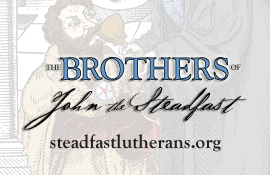 We’re Lutherans, and most of us share a deep love for hot beverages. Coffee, specifically, although tea isn’t too shabby, either. That’s why we here at the Sisters of Katie Luther have paired with Alisha of Schieber Shenanigans to host this giveaway for you! What could be more fun than a coffee mug with a Luther’s Rose on it? You’ll be the coolest at the next potluck or church social hour, so make sure you enter this! Speaking of entering, it’s really simple. Just click through to like both Schieber Shenanigans and our Facebook page if you haven’t already, and then make sure you complete the entry form. It’s that simple! We love simple here. Alisha Schieber is a Deaconess, pastor’s wife, and homeschooling mother to three crazy wonderful boys. Alisha received her undergrad degree in Interactive Digital Media before heading to Concordia Theological Seminary, Fort Wayne for the Deaconess program. Alisha has served as a Deaconess for DOXOLOGY for several years while her husband was completing his studies. She continues to work with some churches part-time, serving as she’s able while still focusing on her family. They live in the Chicago suburbs where her husband is as an associate pastor. Schieber Shenanigans is here to help you express yourself! Specializing in shirts and coffee mugs, Schieber Shenanigans creates designs inspired by scripture and literary works. There will be a pre-sale of items on Schieber Shenanigans 8pm central on Monday, so go check it out! There will be a live video on Facebook showing off the options, then the pre-sale will officially open on the website for 48hrs. These giveaways are great! Sharing new businesses and the good word! Would LOVE to have my morning coffee in a mug like that!! I would love that prettu mug, please and thank you! I would love that pretty mug, please and thank you! katieluthersisters, thanks so much for the post.Really thank you! Great. Fantastic! I love give always! This cup is awesome. My mother loved the 23rd Psalm and I read it to her before her death. Her last words were “in greener pastures”. That was 41 years ago and this song still brings tears to my eyes. I know where she is, with the Lord, and I will be reunited with her some day. katieluthersisters, thanks! And thanks for sharing your great posts every week! Oh I hope you draw my name! I love coffee and coffee mugs. Love this coffee mug. My confirmation verse many years ago was Ps. 23:1. You have a wrong email for me. I corrected it in this post.